Having a well paying job at the Vickers Armstrong Aircraft factory before the war even started, Hilda had her daily routine down pat. She would cycle to work every day, perform her duties as a spar inspector on in-construction aeroplanes, have lunch at 12:30 and at 5pm cycle home. It was the usual, the expected and reliable, until one day it wasn’t. On September, 7 1940, the German bombers managed to locate the factory by the car park next door. The sun glinting off the windscreens of hundreds of cars had acted as a beacon for the opposing forces, leading them straight to the factory to drop their devastating cargo. “If I’d done what I usually did for lunch, then we wouldn’t have even been there.” Hilda recalls, her mug of tea long since gone cold as she gets lost in the memories. The factory did have bomb shelters, but they were unfortunately quite inadequate for the number of employees on shift at any one time. The small bell shaped structures could only protect four people, there were a few scattered around the factory in different departments but it turned out better for Hilda to not make it to the shelter in time. The army had requisitioned any and every vehicle in the area and Hilda was taken, in extremely critical condition, to the hospital in the back of a commercial lorry. Only three weeks before the bombing Hilda had married Henry Morris, a local lad that she’d known for years. They weren’t even living together yet, and upon hearing about his pretty new brides injuries, Henry refused to visit her in the hospital. Even when he was told that Hilda likely only had three days left to live before she would succumb to her wounds, as she had burns on 85 percent of her body. Hilda never saw him again. Despite her very bleak prognosis, she was a fighter. Hilda made it past day three, then to a week, then a month and so on as she began to very slowly heal. It took a total of about six months in hospital before she was able to go home, but was still required to visit regularly for dressing changes and check ups. To this day, almost eighty years later Hilda still has bizarre side effects from the bombing. “If I stand outside in the sunlight, you can sometimes see the sun glint off my skin. That’s a little piece of metal or glass left over. They obviously weren’t able to get it all out so I still get little bits surface occasionally.” She says with a little smile on her face, as though surviving such an ordeal was an everyday occurrence rather than a miracle. 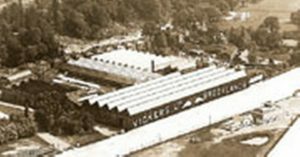 The bombing at the Vickers Armstrong Aircraft factory resulted in eighty-three people dead, over four hundred injured and an untold number of lives irreparably devastated. Yet the war had only just started.